Madison, Wisc.... In a ballsy move that has shocked and surprised many UW-Madison alumni, Chancellor Biddy Martin has taken spray paint to the beloved plaque at Bascom Hall. 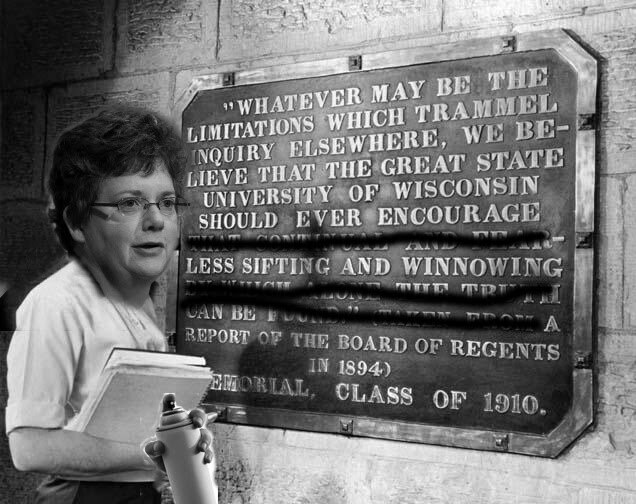 Campus maintenance crews have been asked to evaluate the possibility of grinding the offending words off the plaque. Chancellor Martin followed up on her spray painting party by dashing off a letter to the Dane County Board of Supervisors. The Chancellor argued that enough argument about the use of monkeys has already taken place and that the County should leave well enough alone. The Chancellor had to limit her remarks to this reporter saying that she had to get back to work on a public statement about the hundreds of recent animal welfare, biosafety, and state anticruelty violations at the university that she is still trying to explain away. To whom did Chancellor Martin make these statements to? Have they been published so they might be directly quoted? Don't confuse the satire of the post with her actual words in her letter to the Board of Supervisors.